Clark is exiting Newry Corner on the run towards the ‘Flying Mile’. He started from pole, winning 100 bottles of champagne in the process and finished second in the Saturday preliminary race in beautiful weather but the clouds opened on Monday morning for the Tasman Championship event, ‘The South Pacific Trophy’. Star of the show was Piers Courage who drove a gutsy, skilful race in the most challenging, treacherous conditions to win the event in his little F2 McLaren M4A FVA ahead of the big Tasman 2.5’s of his close competitors. Pier’s car was self run, his performances in it that summer reignited his career. 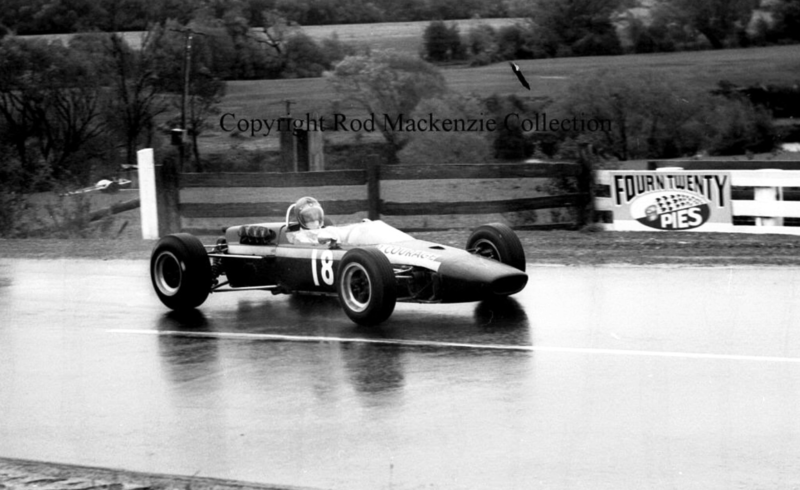 Pedro Rodriguez and Frank Gardner were second and third in BRM P261 2.1 V8 and Brabham BT23D Alfa 2.5 V8 respectively. 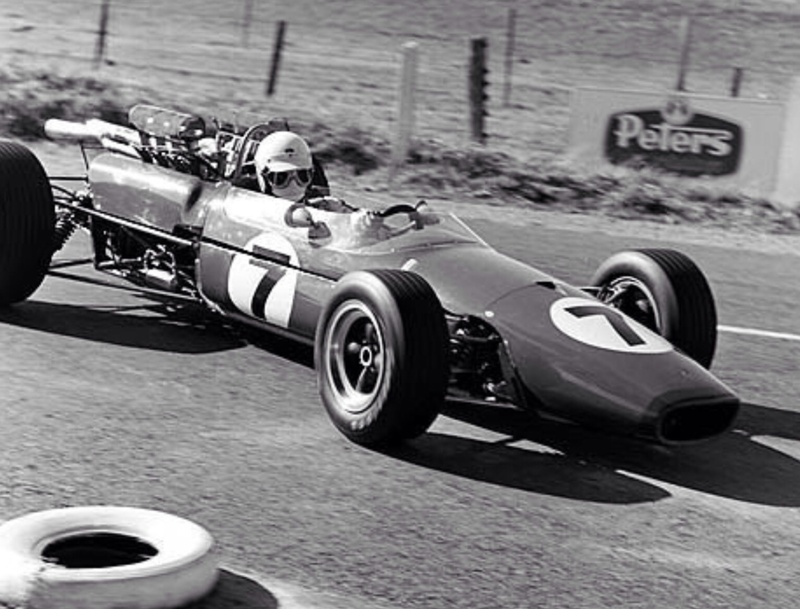 Clark was fifth in his Ford Cosworth DFW engined Lotus 49, the 2.5 litre variant of the epochal 3 litre DFV GP engine. 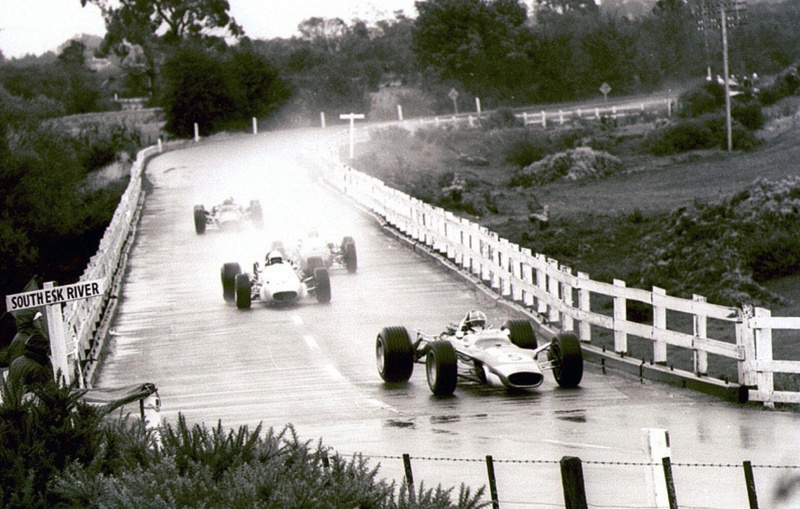 Lets go back to the start of the meeting, marvellous from the Tasmanian’s perspective as the series went down to the wire, Chris Amon was still a potential series victor with only six points between he and Jim Clark with Piers Courage’s third place within Graham Hill’s grasp depending upon how he fared. 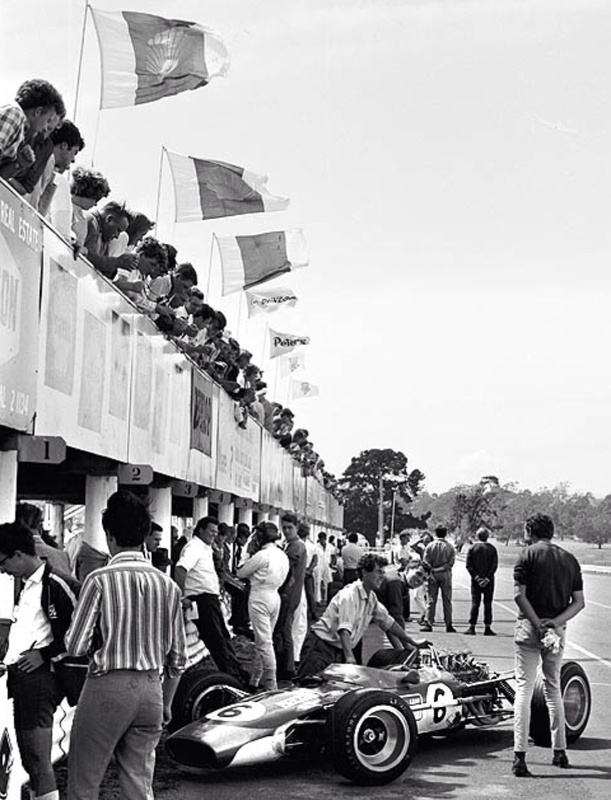 Chris Amon blew the sealing rings in the Ferrari’s little V6 keeping his crew busy for the evening whilst Pedro Rodriguez popped an engine too- the BRM mechanics therefore readied the P261 V8 for the race rather than he P126 V12 the Mexican raced in the Saturday preliminary. Piers Courage tapped the nose of his pristine McLaren M4A when the flaggies got so enamoured of the cars they forgot to signal oil on the track! 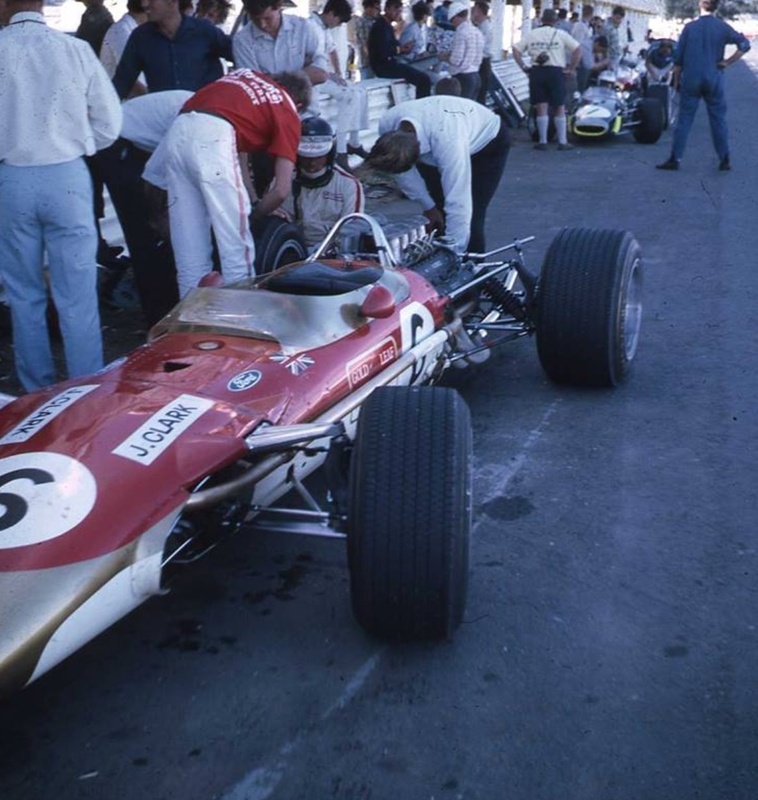 All was well at Gold Leaf Team Lotus. Practice times didn’t mean too much as the teams were focused on race setup for the twelve lap Saturday preliminary race ‘The Examiner Racing Car Scratch’ which also counted for grid positions. In the second session of practice Clark did a 2:12.8, Hill 2:13.6 and Amon 2:13.8. 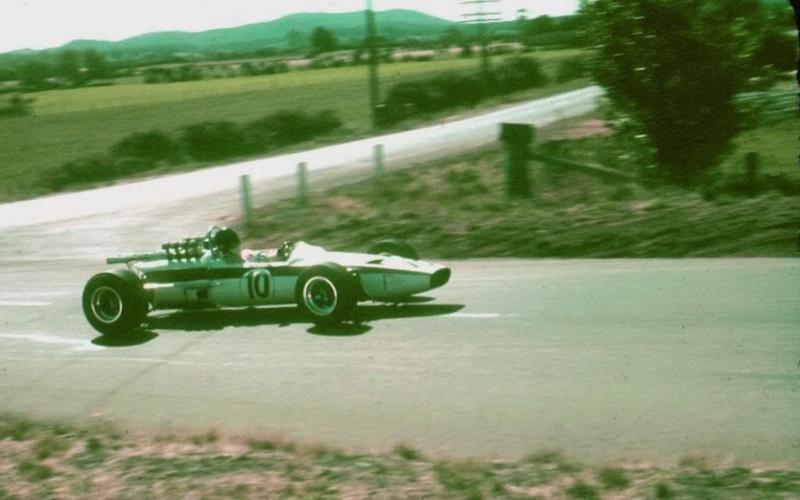 Clark was under Jack Brabham’s record set on the way to his win the year before in his BT23A Repco, Jim won 100 bottles of champagne for pole as stated earlier. In the preliminary on Saturday the grid formed up with Clark on pole. Hill comfortably won the event run in fine, dry weather from Clark and Amon. Both Lotuses were timed on the Flying Mile at 172 mph but Amon’s 182 mph in David McKay’s ex-works Ferrari P4/Can Am 350 sportscar rather put the single-seaters in the shade! Lets not digress about that car now, follow the link at the end of this article for a long piece about the P4 which Chris raced in the sportscar support events in each of the Australian Tasman rounds. The track was almost under water at some points where hay bales had broken up and straw was blocking the drains. Efforts by track officials soon had most of the drainage system under control. A large crowd was of course present on the Labour Day long-weekend. 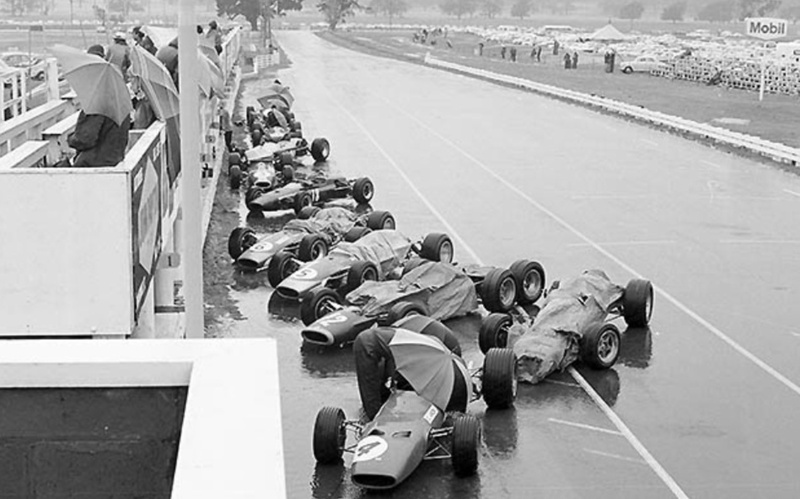 Crews brought the cars out onto the circuit in front of the pit counter and stood together under umbrellas as the drivers went into a huddle with the promoters of the meeting and the CAMS stewards to determine if the race should go on. Sergent.com report that first it was decided that the cars should do a couple of exploratory laps then report their findings. Geoghegan, Amon, Clark, Hill, Attwood, Gardner, Bartlett and others went out and after looking like motor boats ploughing through the water delivered their thoughts to the meeting. 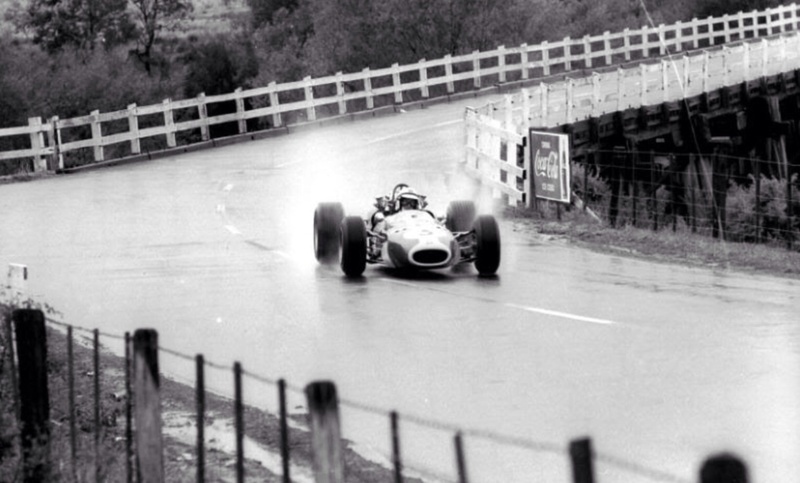 The conditions were so bad various drivers with unsuitable tyres elected not to start having driven some ‘sighting laps’. 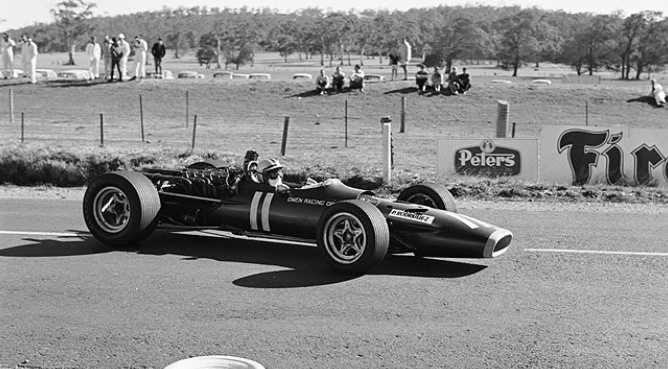 Kevin Bartlett recounted his experience in the Alec Mildren Racing Brabham BT11A Climax; ‘I did two exploratory laps and the old BT11 couldn’t find traction anywhere. I had an absolutely terrifying 4th gear 720 degree spin across the short Kings Bridge, the one after the Viaduct, missing all the obstacles at the tracks edge. After exiting Pub and in a straight line i did a 360 degree loop. She nearly escaped me over the rail line on the way to Long Bridge. Out of Newry and up the hill to the straight slithering along with no touch felt between me and the bitumen, so i suppose I thought at that moment to do another lap at a very reduced speed then pit’. 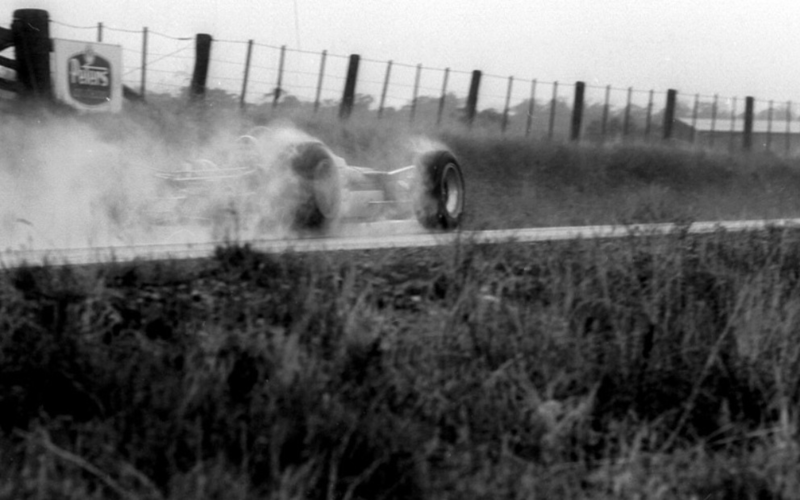 Longford, wonderful circuit that it was, provides no runoff area for a driver to go in the wet (or dry!) 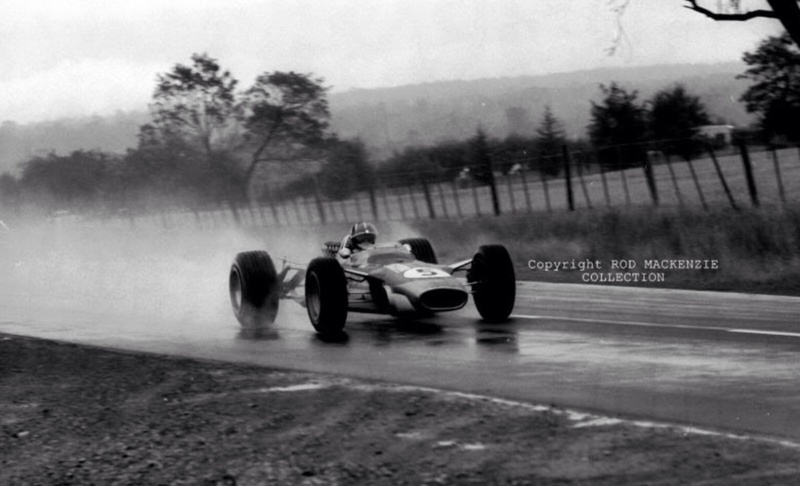 should a driver lose control or suffer a bad attack of aquaplaning, and this was the main point in contention. 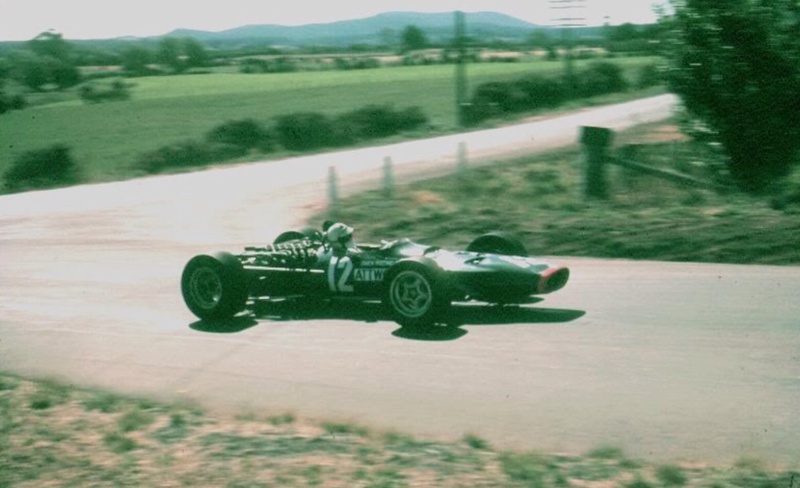 Greg Cusack in David McKay’s Scuderia Veloce Brabham BT23A Repco (Brabham’s victorious Longford mount from 1967) had left the road that morning. He lost the car on the greasy road as he went over the hump/bump on the approach to The Viaduct. The car left the road, hit a bank, somersaulted and crashed into a ditch, he was then pinned under the it before being quickly released by officials. The 37 year old Canberra motor dealer, who had intended Longford to be his last race meeting, was taken to Launceston Hospital with chipped bones to both knees, stretched ligaments and a fractured left wrist. He was lucky it was not a good deal worse. Bib Stillwell organised for one of his planes to fly Cusack and his wife home to Canberra on the Tuesday where he was admitted to hospital. 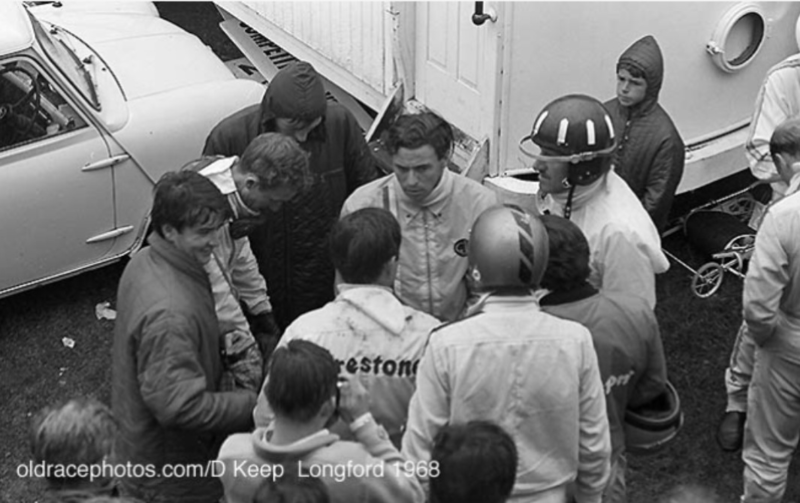 Whilst Cusack lay in hospital the other drivers were trying to explain the difficulties of Longford which were exacerbated hugely in the wet. ‘Motoring News’ reports at length about the cordial discussions between the drivers and officialdom and all of the competing issues of safety, providing a show and running a race to determine the winner of the Tasman Cup. The Stewards finally ruled that the race should go ahead but be shortened to 15 laps of the 4.5 mile circuit, (128 miles to 68 miles) and put the starting time back to 4pm hoping the rain would ease and the situation be safer as a consequence. 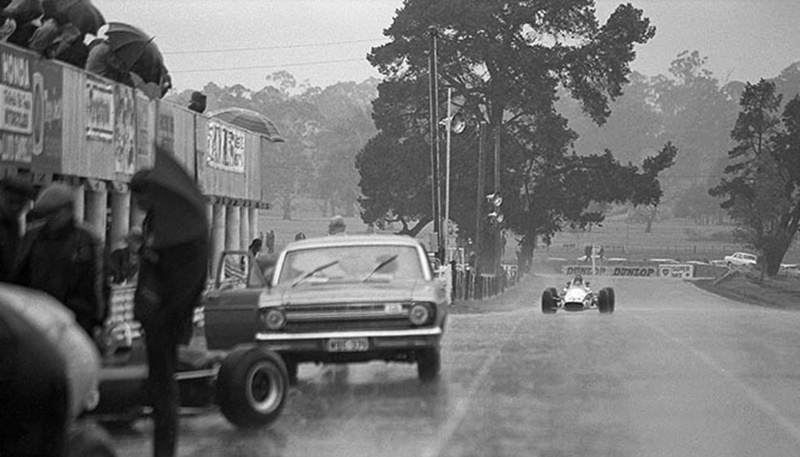 At 4.15pm the sodden cars and their game, uncomplaining drivers were facing the soggiest start ever seen at Longford, one of the most challenging road circuits in the world. 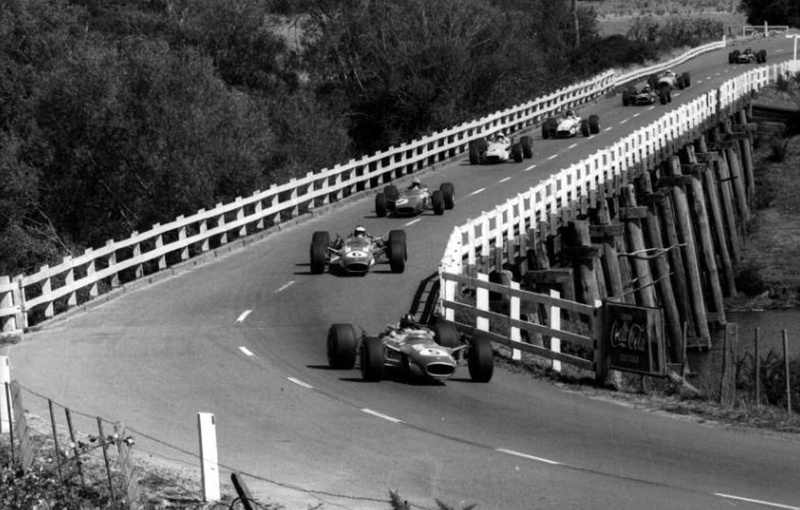 Clark’s Lotus 49 got away well, somehow finding traction with the wide Firestones, and he was followed into the right-hander before The Viaduct by Amon and Hill. 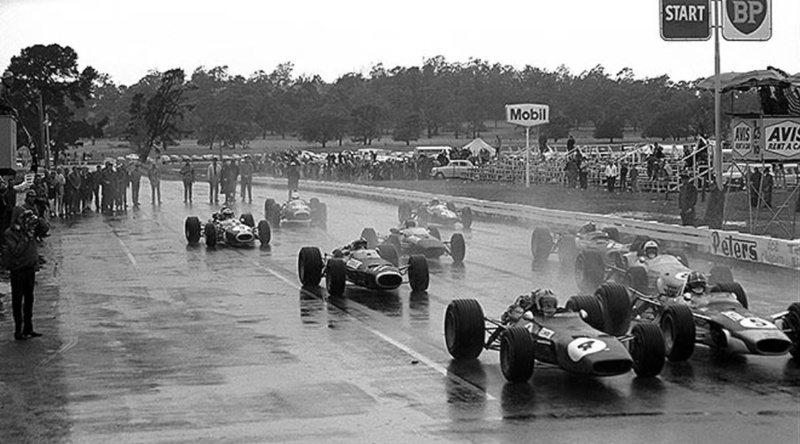 The drivers took the opening laps cautiously under race conditions and each car was leaving a gap to the other so they could see through the flying spray. 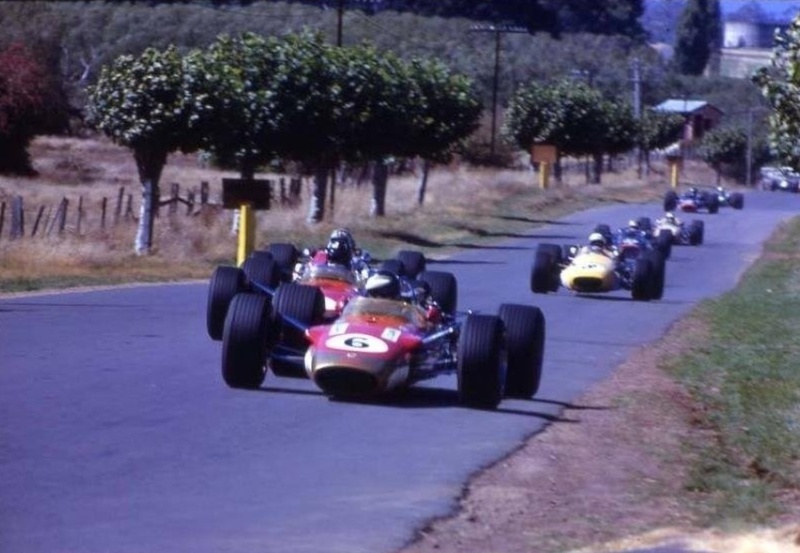 At the end of lap one the order was Clark, Rodriguez BRM P261 V8 on Dunlops, Gardner Brabham BT23D Alfa on Goodyears, Courage Mclaren M4A Ford FVA using new narrow-section 970s, Hill Lotus 49 Ford DFW on Firestones, Attwood BRM P126 V12 on Dunlop, Amon Ferrari 246T back in seventh owing to a run down the escape road at Newry Corner, then John Harvey Brabham BT11A Repco John McCormack Brabham BT4 Coventry Climax FPF and Mel McEwin Lotus 32B Coventry Climax FPF, this car the ex-Clark/Palmer 1965 Tasman Championship winning chassis. 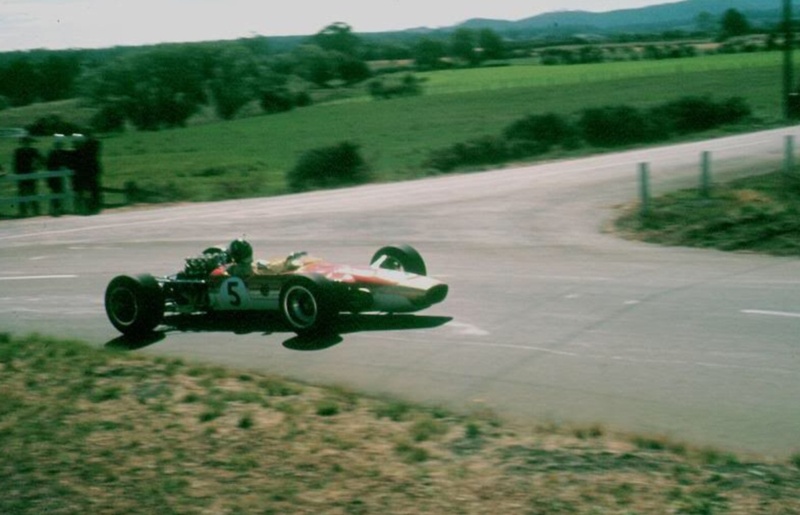 ‘Attwood found he had more traction on Dunlops than Hill had with the wide Firestones and he slipped under the Lotus for fifth place on lap 2. 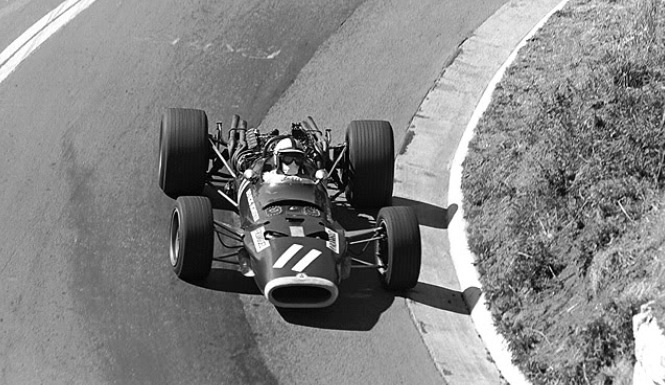 Both Attwood and Rodriguez had hand-cut drainage grooves in their tyres. A lap later Courage really got his foot in it to take Gardner on lap 3. He then jumped past both Rodriguez and Clark on the next lap while Gardner followed him through and waited for another lap behind Clark before taking the plunge and heading for second. Amon had taken Hill and now, on lap 5, the order was Courage 9.6 secs ahead of Gardner, Clark, Rodriguez, Attwood, Amon, Hill and Harvey. McEwin and McCormack were already in danger of being lapped by the flying Courage. 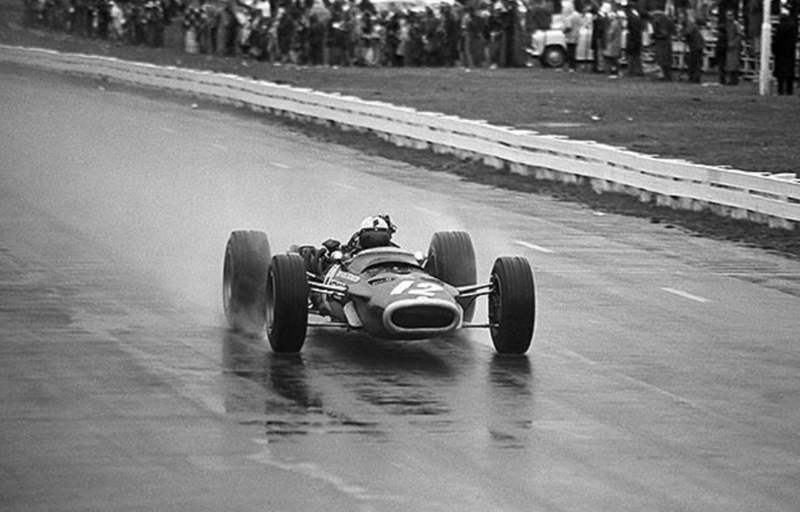 Courage, driving like a young Stirling Moss in the blinding rain, somehow gained another 9.5 secs on lap 6, putting him 16 secs ahead of second man Gardner in the Brabham-Alfa. Rodriguez had pulled past Clark and on the next lap Attwood whizzed past Clark to take fourth. On lap 9 Courage was 32 secs ahead of Gardner and having a ball out on his own, right foot hard in it. Gardner was 3.5 secs ahead of Rodriguez who was followed by Attwood, Clark, Amon, Hill and Harvey losing a lot of ground’. ‘Rodriguez started to close up on Gardner in the closing laps, but nothing could touch Courage. This was his day, it was he who had the best gear on his car and he was darned sure he was going to make it a race to remember. He had pulled 45.5 secs on Gardner by lap 12 while Rodriguez had got within 2.5 secs of Gardner. 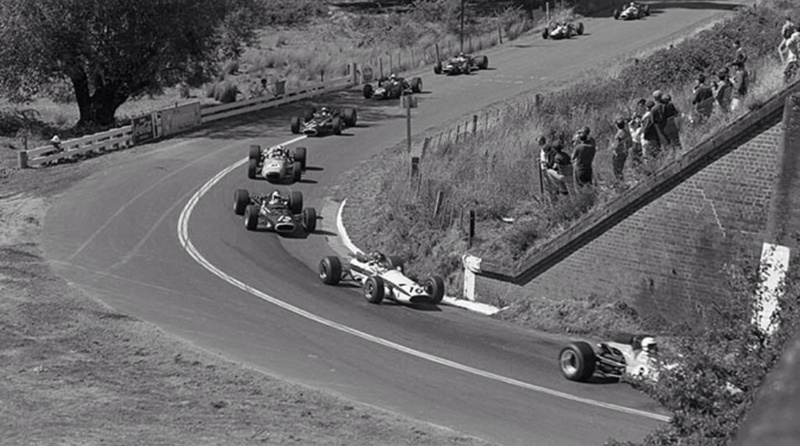 Hill challenged Amon on the same lap and finally squeezed past in a daring effort on the greasy track to make the Lotus-Fords fifth and sixth’. ‘As Courage screamed down the straight heading for the flag he was over 55 secs ahead of Gardner and he came past the pits jubilantly waving his hand. 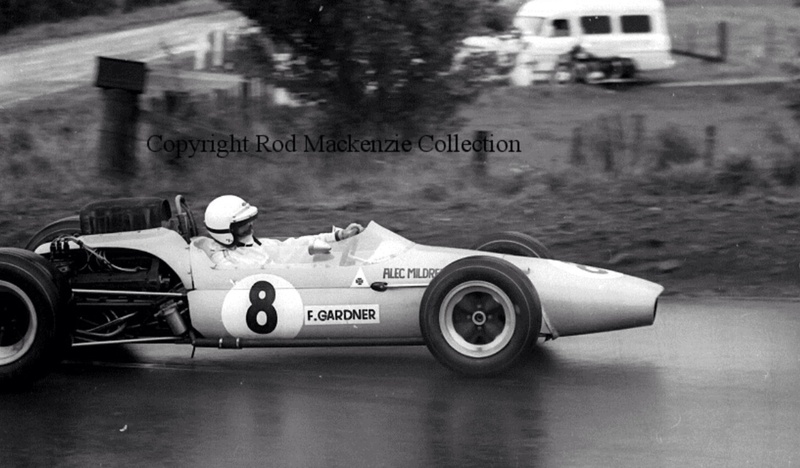 Gardner by this time, heading for the braking area at Mountford, had Rodriguez looking right at the Alfa V8 pipes. 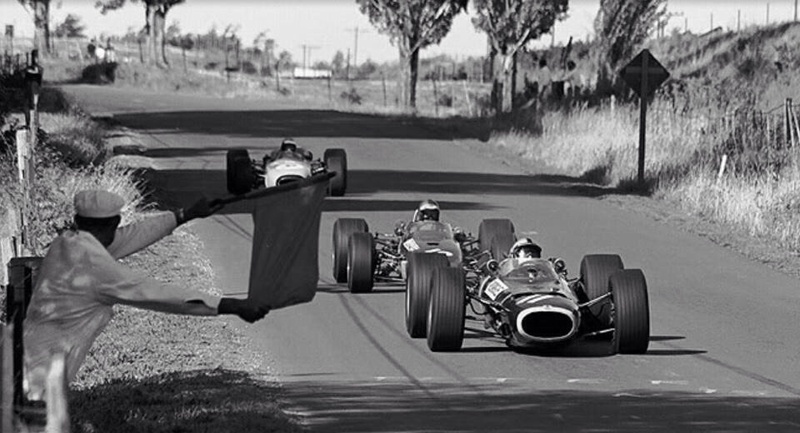 There seemed no way that Rodriguez could slip past, but suddenly a gap appeared as Gardner went a shade wide on Mountford and Rodriguez poured on the power into the short straight and took the flag about 25 yards ahead of the Alec Mildren car. 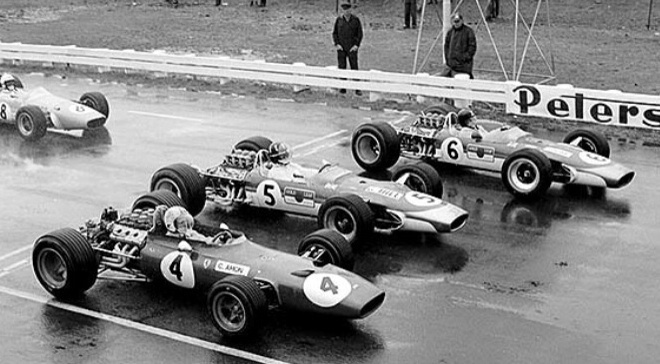 Attwood finished his race fourth after a very steady drive, followed by Clark, Hill and Amon’. 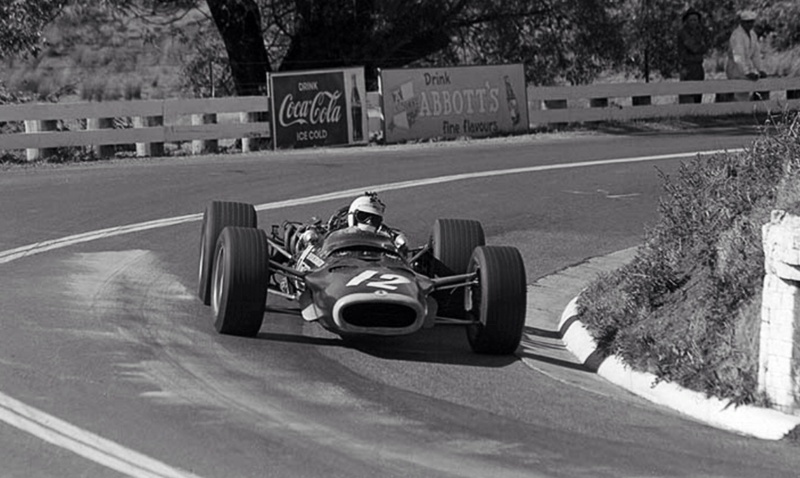 ‘Courage had the rubber, just the right amount of power for the job and the ability to keep the car straight on a very dicey and greasy circuit. 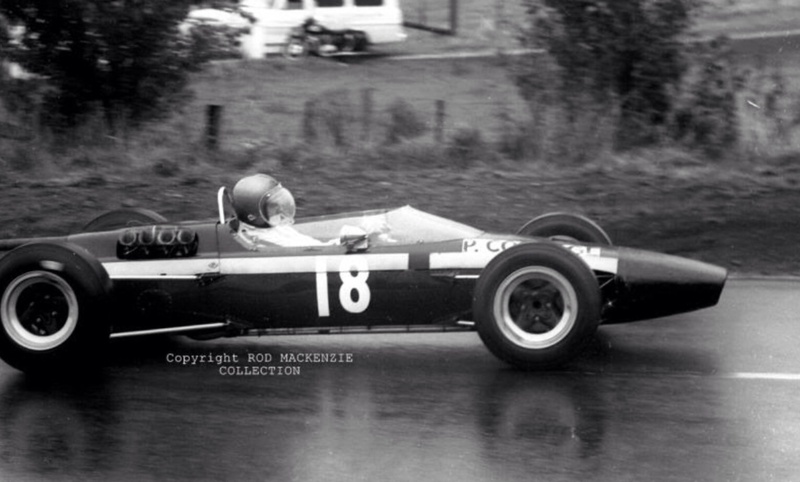 He finished the Tasman Cup Series in a wonderful third place behind Clark and Chris Amon. Then came Hill and Gardner 17, McLaren 11, Rodriguez and Hulme 8, Jim Palmer 7, Attwood 4, Roly Levis and Leo Geoghegan 3, Paul Bolton, Red Dawson and Kevin Bartlett 2, Graeme Lawrence and Ross Stone 1 each’. It was very much the end of an era, the last Longford, the speed of the cars and advancing track safety rules caught up with the place and an inability of the club/government to make the requisite investment. 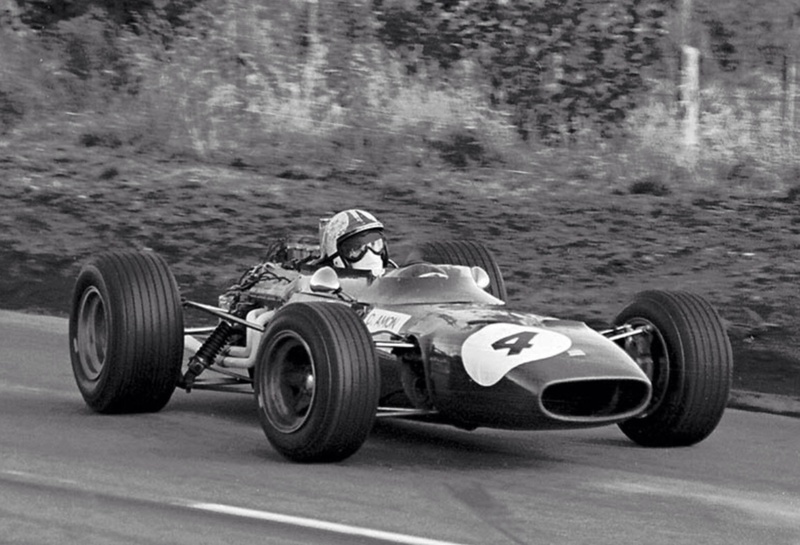 Most importantly Jim Clark, a very popular visitor to Australasia since the early sixties and twice winner of the series in 1965 and 1968 died at Hockenheim in an F2 Lotus 48 in April. 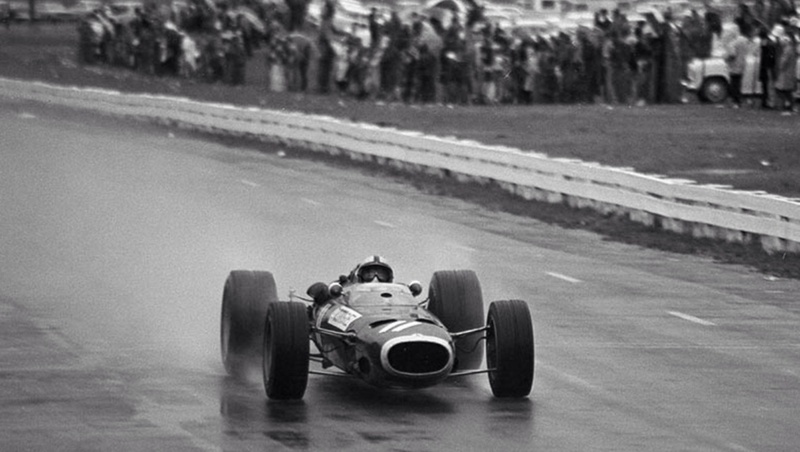 Lotus returned in 1969 but it was not quite the same without the magic and personality of the great Scot.